This screenshot from Deputy Joshua Bender’s body camera shows Bender approaching the truck belonging to Joseph Fisher after deputies used their vehicles to pin and stop Fisher. Fisher can be seen on the left being taken into custody by deputies. No one was harmed in the pursuit that lasted approximately 45 minutes. A Delaware man had his bond set at $35,000 in Delaware Municipal Court Thursday after he led Delaware County Sheriff’s deputies on a vehicle chase through a field Wednesday evening. 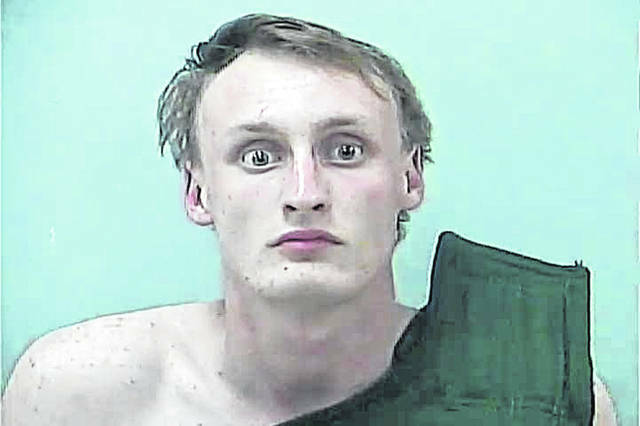 Joseph D. Fisher, 20, appeared in municipal court Thursday, where he was charged with flee/elude and failure to comply. According to a probable cause affidavit filed by Delaware County Sheriff’s Deputy Joshua Bender, Bender was dispatched to 4183 Bowtown Road, Delaware Wednesday evening after it was reported that someone was driving through the fields. Bender wrote that he observed several dust clouds and began searching for the truck, which he located in a field near Bowtown Road and Jumper. Bender wrote he signaled the truck but the truck instead turned and drove the other direction. Bender wrote the truck drove in large circles, causing damage to the field, and traveled over Bowtown Road into the fields between Bowtown and North Old State Road. Bender wrote that in the field, the truck traveled between 40 to 55 miles per hour and traveled between 80 to 85 miles per hour on paved roads. The Delaware County Sheriff’s Office requested a helicopter and the City of Columbus Police Department’s helicopter assisted deputies as they attempted to pin the truck and bring it to a stop. Bender writes that eventually four deputies were able to stop the truck and take Joseph into custody. The Sheriff’s Office reports no one was injured but the deputies’ vehicles and several farm fields were damaged. Bender wrote the whole pursuit lasted about 45 minutes. Fisher had his bond set at $35,000 Thursday and had a preliminary hearing scheduled for April 5 at 4 p.m.
Fisher was in the Delaware County Jail Friday afternoon. 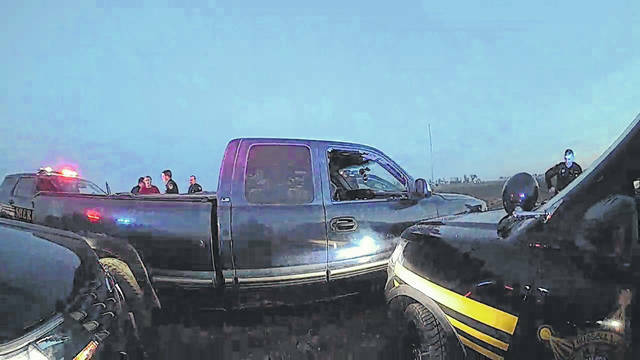 https://www.delgazette.com/wp-content/uploads/sites/40/2019/03/web1_Deputy.jpgThis screenshot from Deputy Joshua Bender’s body camera shows Bender approaching the truck belonging to Joseph Fisher after deputies used their vehicles to pin and stop Fisher. Fisher can be seen on the left being taken into custody by deputies. No one was harmed in the pursuit that lasted approximately 45 minutes.